Are you great at design but lack the know-how to turn your design into a functioning website? I can help. If you’ve designed the perfect website in Photoshop, let me take your design and convert it to a CMS. I offer a PSD to CMS, service that can be completed quickly, while remaining true to your original design. 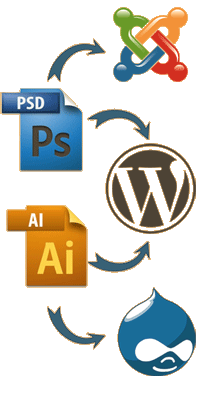 I can convert your PSD to WordPress, Joomla, Drupal or Prestashop. Whether your design is for a small or large site, I can provide you with a professional, standards-compliant theme or template, and all within a fast turn around time. WordPress has become one of the most popular open-source CMS systems, and this platform can be used for websites as well as blogs. It’s known for its ease of use which means many clients choose to maintain their own WordPress site. Whether you’re a graphic designer working for a client who wants a custom designed site, or just an individual who wants to turn their design into a working website, I can help you do this with WordPress. Prestashop is a popular shopping cart platform. I can help you convert your designs to Pretashop and ensure a smooth integration between design and functionality. When using an e-commerce system, it is important that your shopping cart works properly. Broken links and shoddy design can cause customers to doubt the security and reliability of your site. Let me use my expertise to develop a professional looking, standards-compliant template for your design. Geared towards larger websites and organisations, Joomla is another popular open-source CMS. It’s a little more complex than WordPress, but it’s a great option for organisations that need a more robust website. A standards-compliant, well thought out PSD to Joomla conversion can make managing your web content much easier for those who might not have extensive technical knowledge. Let me help you convert your original design into a functional Joomla site. Drupal is another popular, open-source CMS. It is great choice for organisations that want to launch community-based, news, or multimedia rich sites. A professional PSD to Drupal conversion, that accurately reflects your design is my goal. I am confident that no matter the content you require, I can help turn your Photoshop files into a high-quality Drupal site. Click here for more details about PSD to Drupal services.